I was 2 1/2 months in the hospital after my accident. Something “missing” was anything to do with my hands for entertainment. Back to the old standby for children.? Crayons and coloring books? Yes, but as an adult with a Minor in Studio Art, I needed something a little more sophisticated to really feel enthused and engaged. Planning ahead, I know that a stay in a hospital (sometime in the future) will likely be inevitable. 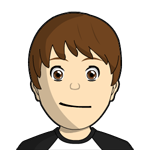 So, here is one of the things I’m working on to use to entertain myself for if or when that happens. I used just two same-size styrophane plates reclaimed from something I bought at the grocery store. I fancied it up with lettering on a thin piece of cedar wood and sealed it with coats of Gorilla Glue for Wood. I did this in hopes that aides won’t throw it away. 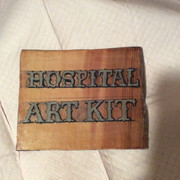 I know that craft shops sell beautifully designed art kits, and those would be a welcome gift for an artistic loved one in a hospital or nursing home...but they are quite expensive. Sadly, there isn’t much respect for the patient’s property in many of those places, so they can inexplicably disappear. 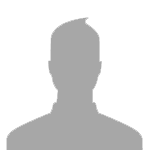 My idea is to make a kit from which I can create something that could become a valuable piece of art, but that the kit would not be confused with trash, and that it would not be a painful financial loss of expensive materials if stolen or accidentally thrown away. So far, I’ve only made this shell. Next, I’ll have the fun of adding colored pencils, a sharpener, eraser, and cut-to-fit acid free art paper. I may break down and order one of these. It looks really nice. And then I can copy some of the details into my own more “disposable” kits. $29.68. Plus I want my kit to have a small supply of acid-free art paper. I have some huge tablets already, so all I have to do is carefully cut the large sheet into standard sized small pieces. I went to the Zatista site to see what people are doing with colored pencils. I saw small colored pencil drawings for $100. 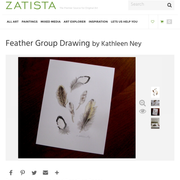 These feathers looked pretty, and it would be something that you couldn’t go far wrong with,...I mean, almost anybody should be able to draw a recognizable feather. Including something to draw in the art kit would definitely make the best use of your time. There’s not much to look at in a hospital room. Feathers seem like a great idea. 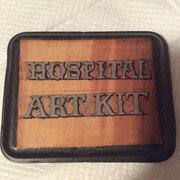 What else could be stored in an art entertainment kit? In the interest of full disclosure, I decided that the flimsy little styrofoam container was too unreliable for my art supplies. It could spill everything. So, I’ve cut away the styrofoam edges and I will attach my calligraphy to some other container. Right now it looks like this. 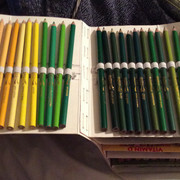 My $29.68 colored pencil kit arrived this afternoon. 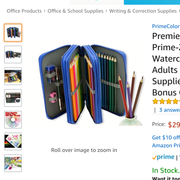 I’m in love with the zippered case, however, the colored pencils have no “color names” on them. This can be fatal to a good piece of artwork,...grabbing the pencil that’s one shade off from the one you had actually been using. 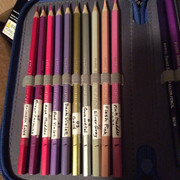 So, I’m labeling them - borrowing names from a different set of colored pencils. Also, I’m not very impressed with the strength of the colors. I tested them on paper, but haven’t drawn with them yet. And I haven’t used them wet yet. This is just my report for fellow forum members. P.S. I tried coloring with the colored pencils and then adding water for the watercolor effect that they are supposed to produce and....(sniff)... that part is a total fraud. They are advertised as being usable dry or wet, but they only really work dry. Very helpful post vintage, I had my laptop with me when I was in my stay in the spinal injury unit. I made friends and visited new patients, went to physio etc. When I have had to stay in hospital its quite different, a laptop keeps me busy and i write ( type ) or mentor students and listen to music. If I did not have a laptop with me, I would read most likely, I have books that I dont have time to read or maybe I could give tarot readings to patients..but maybe not! You kept busy, enjoyed your downtime as much as possible and cheered up other people. Did you have those books picked out in advance? When I was in the hospital, I wasn’t capable of getting into a wheelchair alone, and the staff left me lying in bed for days at a time, refusing to get me into a wheelchair. I only had a small, old-technology cellphone. It would barely look up phone numbers. So, due to this awful experience, my thoughts on my own hospital entertainment can’t revolve around internet or even visiting other patients....and all my physio was limited to stretchy cords and “how to put on socks” in bed. I did have a large TV and cable. Lol. I saw every installment of that adventuresome family that moved to Alaska. I mean, I truly needed entertainment that wasn’t dependent on technology or friendly human contact. 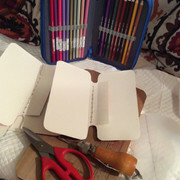 I’m making a cheapie copy of that darling zippered colored-pencil case. I’m using milk carton cardboard. It’s the same length as the Prime-Zone original, but more narrow. 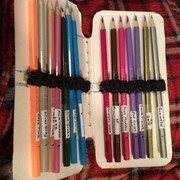 My pencil case will hold about 35 pencils rather than 48 like the original,...unless I add an extra two panels. I’ve ordered a bunch of zippers from Zipper Shipper. 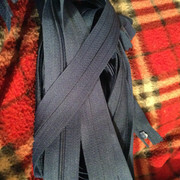 I covered wide rubber bands with black cotton/polyester fabric. And I’m almost finished assigning names to the originally nameless colored pencils. Btw, this last one was a huge chore. I recommend only buying colored pencils with that come labeled with the color name,...unless you just really like a time-consuming challenge. I’ve improved on my above design. This one is faster and easier. Instead of copying the measurements of the ‘purchased’ pencil holder, I now use half gallon milk cartons and just ‘go with the flow’, using the already-occurring folds in the milk carton. I also like embroidery. I can’t reach my embroidery thread right now, but to give my photo an indication of scale, I’ve made a few stitches on denim with just regular sewing thread. 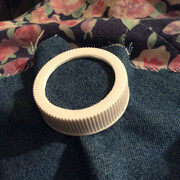 To make this tiny embroidery hoop, I cut a hole in a plastic kombucha bottle cap and cut a hole in a plastic water bottle cap. 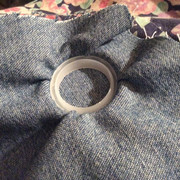 Then I used the plastic water bottle cap to cover the denim and pushed it up inside of the other cap. It’s a tight fit. This holds the fabric taut. 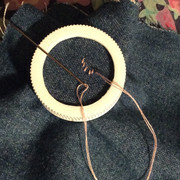 So, the miniature embroidery hoop cost nothing. I could put embroidery thread, needles, and several of these hoops in a hospital entertainment kit. 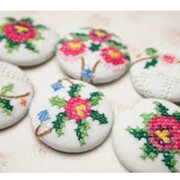 The finished embroidery would be about the right size for covering a large button. These below are from the internet. I used to play chess on my laptop. By the way, do you still play chess on your tablet? I haven’t played it ever on my computer, but I’d looked into it. I don’t want to subscribe to anything or put my privacy in jeopardy. I’d play a few rounds with you if I could do it “for free” and safely...and you’d like playing with me because I try real hard, but usually loose. Great idea so far. I like it. Thanks, austin4. I think that it’s very important for people who are “shut-ins” to have something to do,...a project,...something to make,...something to learn. Nowadays, many people fill this need “online”. In my case, sadly, my nursing homes had either no internet or very minimal connectivity, and I didn’t have my own. I didn’t have money to buy my own. Over the year and a half that I was in hospitals and nursing homes —virtually as their prisoner—I came to realize that I needed to go back to the old-fashioned ways of entertaining myself,...books, art, language-learning. If I’d had yarn, needles, and instructions, I would have learned to knit and crochet. So, having gone through boredom for an extended time, I want to line up some fun things to do if there’s ever a ‘next time’.